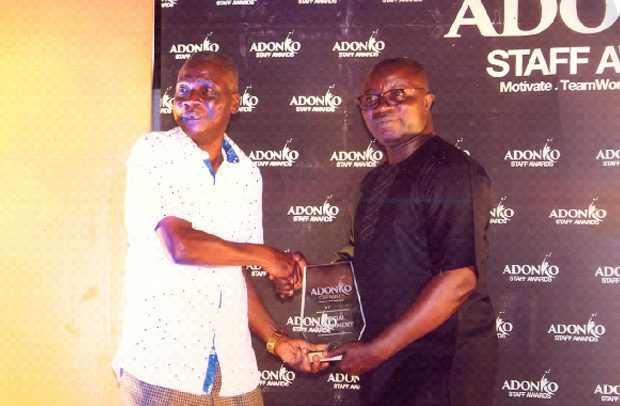 Management of Adonko Company Limited has awarded 50 employees at a ceremony held in Kumasi, the Ashanti regional capital. The event was used to appreciate the efforts of loyal workers who have served the Angel Group of Companies for more than 10 years. Award-winners included Hetty Asante, who received a 32-inch television for the being the best secretary, while Kakari Yeboah was adjudged the best administrative worker. Speaking at the awards night, the Managing Director of the Angel Group of companies, Kwaku Oteng, advised all the members of staff to work hard in order to sustain the company. The Member of Parliament (MP) for Kwabere East, Fransisca Oteng Mensah, also entreated staff of the company to collectively work as a team. “Managing a company as a team is very essential,” she added. Chief Executive of Kumasi Metropolitan Assembly (KMA), Osei Assibey Antwi, cautioned workers to desist from absenteeism, stealing and loitering during working hours.